Okay – ‘plague’ is a slight exaggeration. It’s just one huge locust, actually. And truth be told, it’s just lazing about destroying nothing at all. But “Solitary grasshopper just sits there in Victoria, Canada” isn’t much of an attention-grabber, is it? I guess Exodus 10:14 – “There had never been so many locusts, nor would there be so many again” – still holds the record for Most Locusts in a Single Plague. All told, this insectile work of GPS art required 67 kilometres of cycling… 41 with my Garmin ON and another 26 dashing here and there to connect the dots where the roads didn’t cooperate. I’ve rotate the image 90º CCW for ease of viewing. 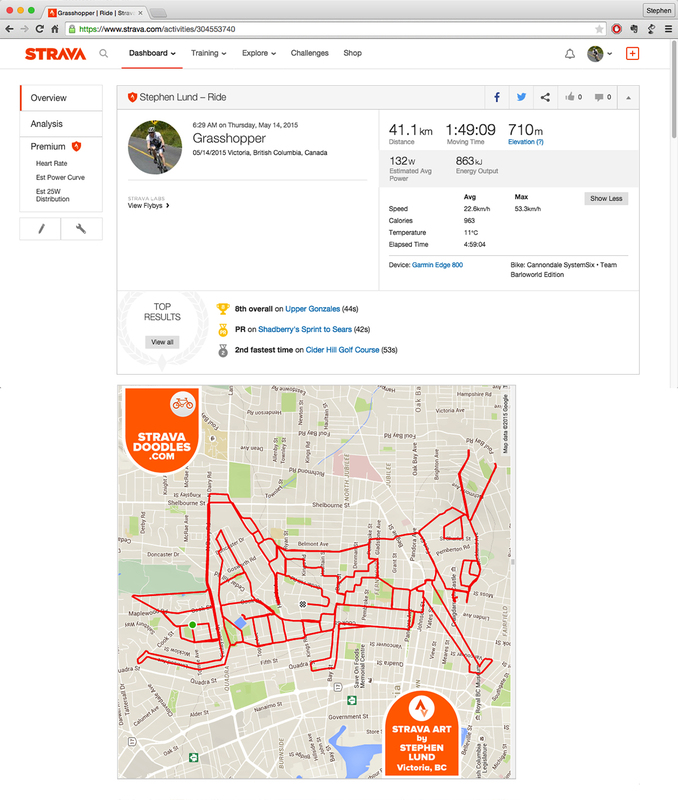 This entry was posted in gps art and tagged creativity, cycling, cyclist, garmin, gps, gps art, grasshopper, insects, locust, strava, strava art, victoria bc. Bookmark the permalink. You got me being a Canadian from Victoria, then the locust and grasshoppers especially the Exodus. Not to worry, both are edibles.